Research in controlled-environment agriculture seeks to help address challenges for production and health value in food grown. Variables in environmental conditions such as temperature, humidity, light, CO₂ and air quality, water, plant nutrition, and lighting all influence plant growth and development. Light quantity (intensity and duration) help drive photosynthesis and overall biomass accumulation. Similarly, light quality (spectral composition or color) refers to the wavelength of light, from UV to far-red for most plant research, and affect the efficiency of photosynthesis and accumulation of secondary metabolites like flavonoids and other phenolics. My work on light quantity and light quality attempts to address ways for optimizing target lighting levels for efficiently maximizing growth morphology and secondary metabolites of biomass and nutritional content of herbaceous annual food crops grown in hydroponics. 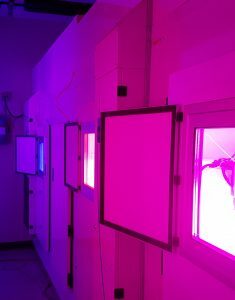 Long-term objectives of this work is to increase the efficiency of plant growth by directing nutrient uptake in plants to target specific goals for biomass and phenolic concentrations within a controlled environment using precise light quantity and quality applications as the controlling mechanism.